It is known that fat droplets are made into emulsion droplets via the addition of bile salts. It is then said that the emulsion droplets are made into micelles through some sort of lipase, which can be absorbed and transported to different cells through the LDL and HDL pathway. My question is what is the biochemistry for transforming emulsion droplets into micelles? How does water, lipase, and other factors make these micelles? Fat (triglyceride) enters the small intestine in the form of an emulsion of droplets which are stabilised by surfactants from the diet including proteins and phospholipids. Bile salts (BS) bind to the surface of these droplets, displacing proteins. The BS-stabilised droplets are the substrate for pancreatic lipase which can adsorb to the BS-stabilised surface and convert the triglycerides to monoglycerides and free fatty acids. 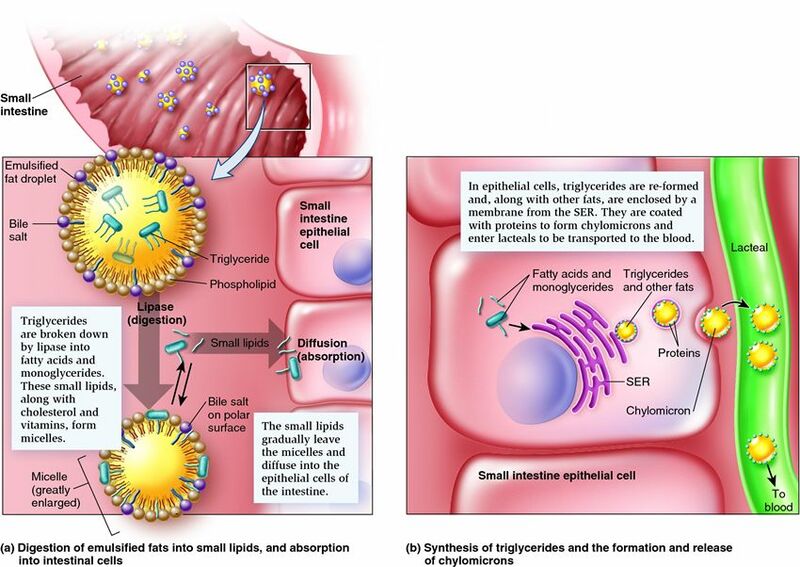 The products of lipolysis then enter micelles that are formed by BS and phosphatidylcholine (PC: also in bile). The prevailing view is that these micelles take the form of discs of bilayer-like structure with BS situated both around the edges protecting the exposed acyl groups, and also embedded within the PC bilayer. I think that the mechanism by which the products of lipolysis move from BS/PC micelles into enterocytes is not known. However, once they have entered they are re-esterified to form triglycerides which are packaged into chylomicrons (a class of lipoproteins) and exported into the lymphatic system. Not the answer you're looking for? Browse other questions tagged biochemistry physiology digestive-system fat-metabolism or ask your own question. How are the two ATPs (properly 1.5 though) formed from oxidation of 1 FADH2?